Event| Free Concert for This Valentine's Day! Are you looking for that date this coming Valentine's? Have you made any plans yet or are you wondering where to go on a tight budget? Sometimes you actually secretly wished that Valentine's day was a holiday, admit it..... Hahaha. Well, I just wanted to share with you a pretty cool and free event if you haven't figured out where to go yet. 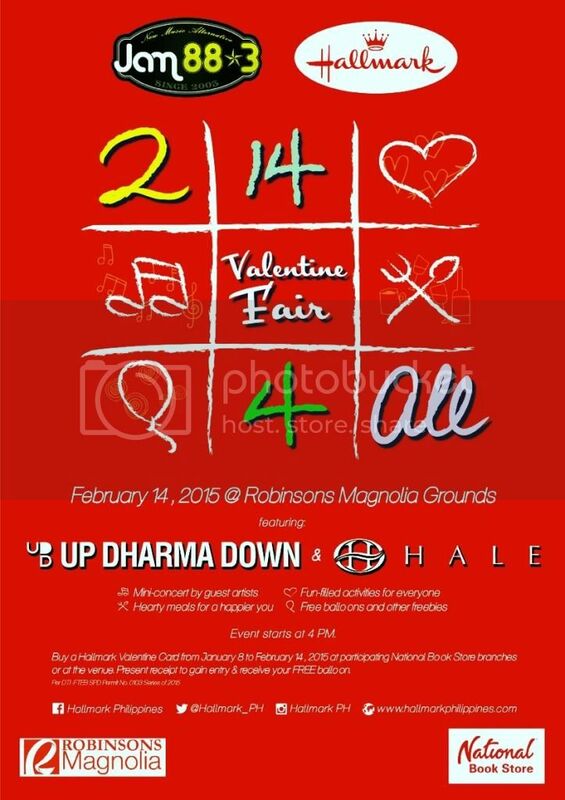 You could spend a night of music and love at the HALLMARK & JAM 88.3 VALENTINE FAIR on February 14, 2015 at the Robinsons Magnolia Grounds. Rock the night away with special performances by Up Dharma Down and Hale! Bring a date, bring your BFFs, or bring your whole family! This is the best part, all you have to do is to just purchase any Hallmark Valentine Card at any National Bookstore and present the receipt at the event to gain FREE entrance! Hallmark Valentine Cards are exclusively distributed by Filstar Distributors Corp. and are available at all National Book store branches and other fine retail outlets nationwide.